We’re doing the Sketch Challenge over at Splitcoast today. I’ve taken some liberties with the layout as there’s supposed to be a rectangle shape where my ornament is. But that’s what it’s all about right? It’s all about our own interpretation of the sketch. Today I’ve used a 6 1/2″ x 5″ card base in white. It’s been stamped with a snowflake image and heat embossed with SU Iridescent Ice. Next comes a layer of aqua. 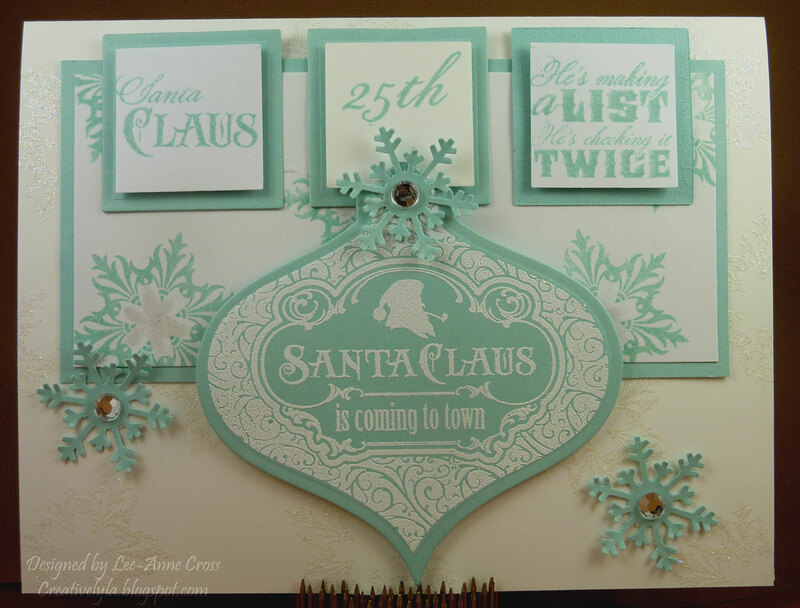 Then another layer of white that’s been stamped with the aqua color that’s been set with the heat gun before adding some centers to the snowflakes with more Iridescent Ice. Then, there are three squares cut with Nestabilities dies in aqua topped with three different stamped squares. The white squares have been popped up on dimensionals for added depth. The ornament was stamped in Versamark, heat embossed with white embossing powder, then cut out with a Spellbinders 2011 Heirloom Ornaments die. I’ve added some snowflakes with some rhinestones for a little more bling. Next Next post: Make Merry!